A partial solution to quietening noisy PCs can be to reduce the speed of internal cooling fans. Low-cost fan speed controllers are available, but they often employ inefficient, heat-generating linear regulators and contain no temperature feedback mechanism. This idea makes use of a readily available, cheap in-car mobile phone charger. The majority of these use common circuitry and require only minor modifications to operate as efficient fan speed controllers complete with temperature feedback. 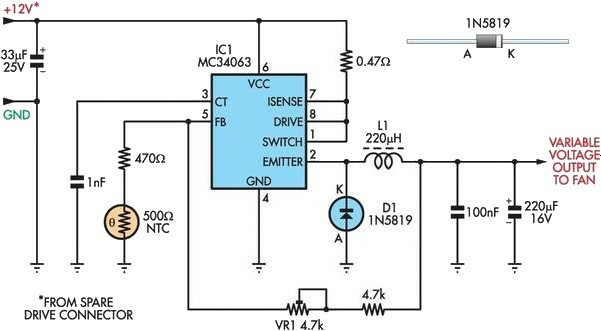 Most in-car chargers are based on the well-known MC34063 DC-DC switchmode IC. When used for charging mobile phones, the open-circuit output voltage is typically set to between 7V and 9V. This is achieved with a simple voltage divider across the output, the centre point of which connects to the feedback input (pin 5) of the MC34063. To make the output voltage var-iable with air temperature, first replace the upper resistor of the divider with a 4.7kΩ resistor in series with a 4.7kΩ trimpot. The lower half of the divider is then replaced with a 470Ω resistor in series with a 500Ω NTC thermistor. These values are only a guide and can be varied to suit different thermistor and fan types. Note that component lead length should be minimised to avoid introducing noise into the feedback circuitry. Getting the correct fan starting voltage is a matter of trial and error. The values shown on the circuit give a starting voltage of about 6.8V at room temperature but trimpot VR1 can be used to raise this voltage as necessary. The output can then rise to about 10V if the interior temperature rises sufficiently. The 4.7kΩ resistor could be reduced to 3.9kΩ and VR1 adjusted to give a lower starting voltage if the fan speed is still too high at 7V. After running for one hour or so, the fan voltage as set by the interior case temperature thermistor on my PC settled at 7.4V. Suitable chargers are available from Oatley Electronics, Cat. No. 2D0074. They’re currently listed at $5 for two, which is less than the price of the MC34063 ICs alone! Data on the MC34063 can be downloaded from www.onsemi.com and a useful development aid is to be found at www.nomad.ee/micros/mc34063. Finally, note that not all chargers have an output filter capacitor installed. Typically, this is a 220µF 10V or 16V electrolytic type. To save a few cents, the manufacturers sometimes leave this component out, relying on the mobile’s battery to perform the filtering task. If this component is missing from your charger’s PC board, it should be installed before the supply is used.